Ebola is not just a West African problem: the world must wake up. Four weeks ago, O B Sisay came back to London from Sierra Leone. He’s a political and economic risk analyst specializing in Africa. When he was in Kenema (SE Sierra Leone), he saw how worried the local people were about Ebola. 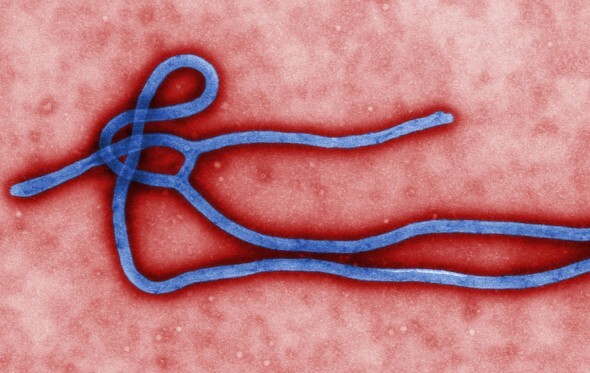 This outbreak of Ebola is the worst since 1976. Nearly 900 people have died, and there have been at least 1,200 people with Ebola in Guinea, Sierra Leone and Liberia. When Sisay got on his plane to London, he was worried that there were no checks for Ebola. He was getting on an international flight, leaving an area with many deaths. Also, when he arrived in Heathrow, there were no checks for symptoms of Ebola. Sisay wrote to Dame Sally Davies, the UK’s Chief Medical Officer. He said we need more safety procedures in both countries. He got a reply two weeks later (mid-July) saying there were no reports of cases of Ebola taken to countries outside of West Africa. Airport checks cost a lot of money and did not have much effect, as the Ebola virus has an incubation period of 21 days. But last week, a US citizen died in Nigeria. He had come from Liberia, with Ebola. Foreign Secretary Philip Hammond had an emergency crisis meeting. Suddenly it became clear that Ebola could travel to another country. Because of globalization and air travel, the virus will not stay only in West Africa. Lucy Moreton, Immigration Service Union (ISU) General Secretary said that ISU members did not have enough equipment. She said the staff need more information about the deadly virus. Recently, a 70-year-old Gambian woman died at Gatwick airport. People were afraid that Ebola had arrived in Britain. But tests from the Department of Health showed it was not Ebola. More medical and foreign policy professionals are worried that local governments are not doing enough in Ebola areas. They are also worried that security is not good enough at London’s airports. The first case of Ebola was in Guinea in March. Since then, Sisay says, national governments and international organizations like World Health Organization (WHO) have thought the problem is less serious than it is. It was not until the last week of July that Liberian President Ellen Johnson Sirleaf said they were closing the borders and Sierra Leone’s President Ernest Bai Koroma called for a public state of emergency. Journalists in Sierra Leone and Liberia have said that not many people are going into hospital because the government’s awareness campaigns are not good and people do not understand. (Ebola seems similar to cholera and diarrhoea). Sisay says that people did not want to go to hospital, because they were afraid they would get Ebola there. Other people thought at first the virus was only a story and not real. ‘I think the WHO and national governments thought this outbreak of Ebola would be like outbreaks before and end after just a few months without spreading much. But the outbreaks before were in more isolated areas. This is not the same as West Africa, where people cross borders more,’ he adds. Two respected doctors – Samuel Brisbane from Liberia and Sheik Humarr Khan from Sierra Leone – have died in the outbreak. Two Americans, Kent Brantly, a doctor, and Nancy Writebol, from Christian aid group Samaritan’s Purse, are still fighting to survive. Noyes says health education is the most important thing. He believes it is very difficult to educate people in the communities where there is Ebola and to give advice on how to stop Ebola spreading and how to treat people who might have Ebola. Local governments are doing what they can to stop Ebola spreading to other areas. Aid agencies are still asking for money. The World Bank said this week that it is giving $200 million to help. But there is no sign that the number of deaths will fall. Many people are afraid that Ebola is spreading too fast, in Africa, and in other parts of the world, too. It will take a long time before the people of West Africa can be free of the deadly virus and start to live again. NOW READ THE ORIGINAL: http://newint.org/features/web-exclusive/2014/08/06/ebola-international-response/ (This article has been simplified so the words, text structure and quotes may have been changed).